The following statements were posted in an online community for people who are trying to overcome their addiction to World of Warcraft (WoW), an online role-playing game. The postings have not been edited or altered except as specifically noted. Some game-related jargon is difficult to understand for casual observers, but the general thrust of each gamer’s experience provides some insight into the struggle of quitting or reducing time spent playing. I am 14 and I’m a freaken [sic] addict…my parents seem to care but never try to kick me off or even try to help. I have 2 lvl 70’s one that is full t6 and other full t5. Thus I have no life I can’t even imagine what I would do if I deleted my toons. I really want to quit but I can’t. I mean this [expletive deleted] game is controlling me and I can’t stop. i have almost deleted my toons but I’m afraid I’ll just start up another one. I’m 12 and I can’t stop playing WoW. I play about 8-10 hours a day mostly because all my friends are on it, and I’m bored when I don’t play it. I just failed socials too so wat [sic] should I do. WOW addiction is no joke. I started to play becuase cousins and friends played (who are by the way all overweight). At first all I did was play WoW once or twice a day for lets say 2-3 hours. Then out of the blue my cousin stoped playing because he said he was addicted to WoW so he gave me his 70 (rogue). Well after that I was on 6-10 hours a day. I ignored my friends went from working out 4 times a week to twice. I would cuss people who asked me to get off. In the end though I relised by playing WoW I was just supporting big bussiness. Also, why waste money, time with friends for a game? I know people who would be alot better off without WoW. I just want to try to get all the money I have invested into it back so I am going to sell the (rogue)….. I want to quit WoW so badly, I’ve been playing for 2 years… The problem is that I don’t know what else to do besides play video games 🙁 . I ended up ill with a deep vein thrombosis in one of my legs caused, according to the doctors, by me sitting on my backside doing instances all night and all day. The creator of the website WoW Detox, Gary Haran, started it up after quitting Warcraft himself. He said that many of his online friends confided that they, too, wanted to quit but didn’t have an outlet for expressing those feelings. “So I created wowdetox.com so that anyone could anonymously write their reasons for quitting the game,” wrote Haran. “The first day I had about 20 posts. The second I had 400. The third I had over 900.” The site was up to 20,000 posts by the time he sold it several months later. That’s a lot of people with a serious problem. This is not the only website where game-addicted people vent their frustrations with themselves for letting a game take over their lives. Similar sites exist for other massively multiplayer online role-playing games and video games in general. Parents – it’s up to you to help your child. Let’s go back to the first posting in this article where a 14-year-old writes, “…my parents seem to care but never try to kick me off or even try to help.” As with any other addiction, there may be resistance to change and withdrawal symptoms. It will take work on your part to help your child find interests and activities to replace video games. And it may require outside help, such as a therapist or treatment program if there are underlying problems that led to the game obsession in the first place. 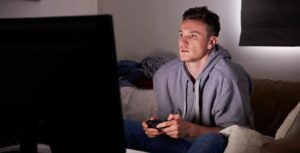 But video game addiction can be treated, and your children need your help.